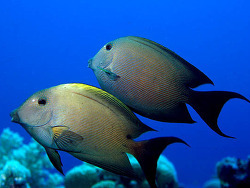 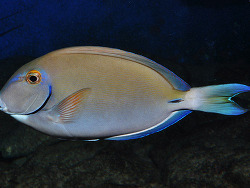 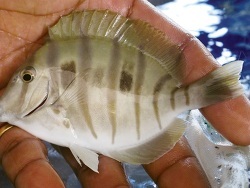 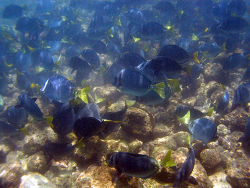 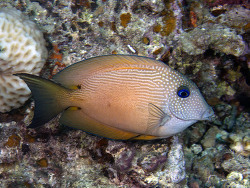 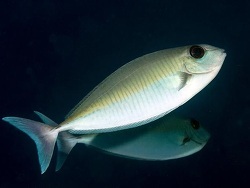 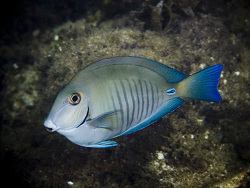 Surgeonfishes and Tangs belong to the family „Acanthuridae“ and are classified into six genera which include Acanthurus, Paracanthurus, Ctenochaetus, Naso, Zebrasoma, and Prionurus. 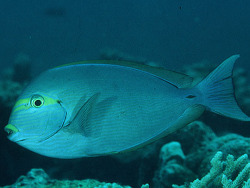 They are commonly referred too as Doctorfish and can be identified by their characteristic spine or spines on the sides of the caudal peduncle. 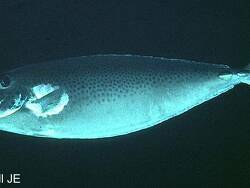 Each side bears either a single, sharp, hinged spine, or one or two immobile, keel-like, razor sharp plates. 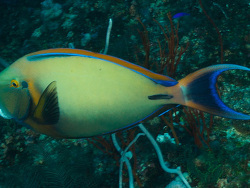 Surgeonfishes and Tangs uses these spines as a means of protection by rubbing or brushing up against their aggressors in a quick sideways motion. 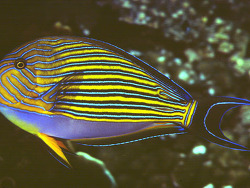 The characteristic razor sharp spines can inflict deep cuts or wounds, especially from that of larger specimens. 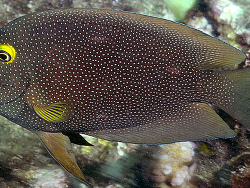 Extreme caution should be used when keeping Surgeonfishes and Tangs. 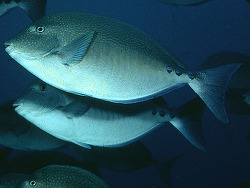 Members of this family generally remain small or medium in size, with a few adult species reaching larger sizes to about 38 cm and more. 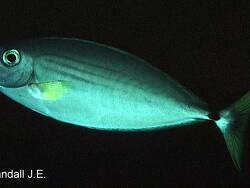 These are the members of the Acanthuridae that should be disqualified as aquarium fish on the basis of growing too large. 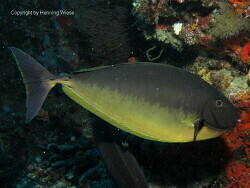 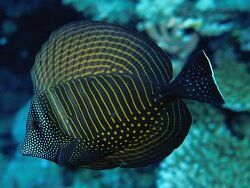 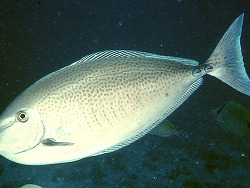 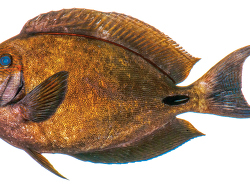 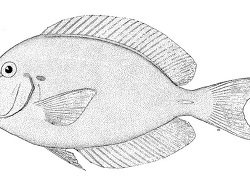 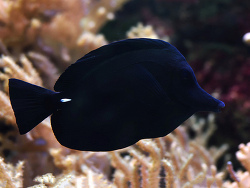 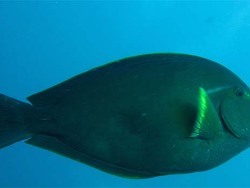 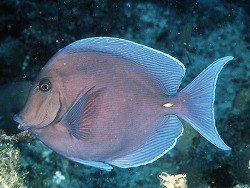 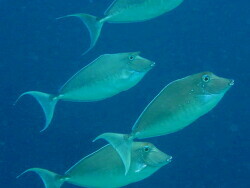 However, the Unicornfishes, named for the single horn-like spine on the front of their heads, reach an average length of 38 to 50 cm, with the Naso unicornis species sometimes growing to 60cm. 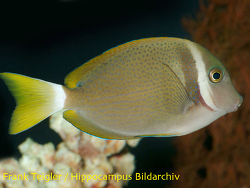 Surgeons are usually active fish that naturally roam over long distances across the upper reef, grazing on natural algal growths as they go. 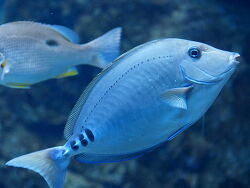 As such, swimming space, diet and water quality are of primary importance. 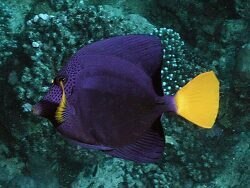 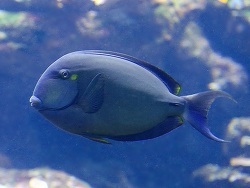 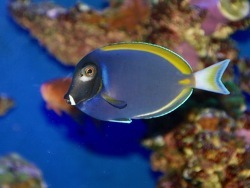 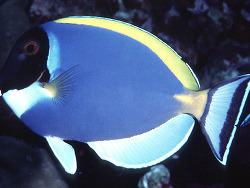 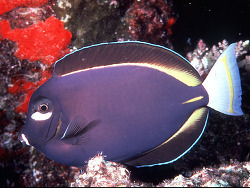 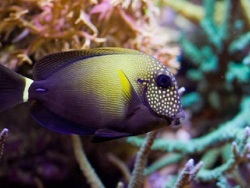 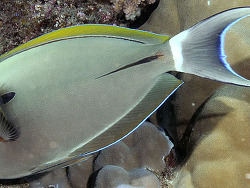 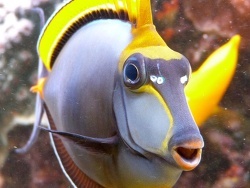 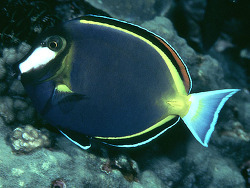 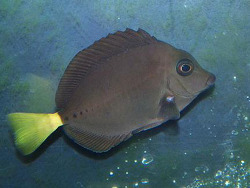 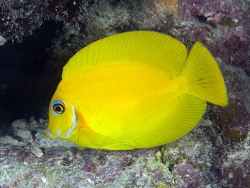 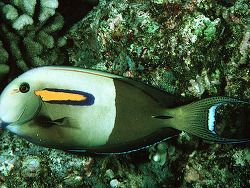 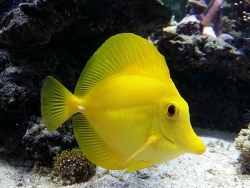 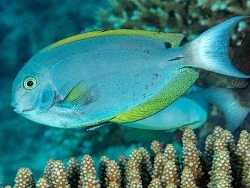 Even the smaller tangs, such as the popular yellow tang should be housed in large 'long' systems and fed plenty of supplemental green foods. 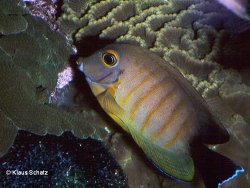 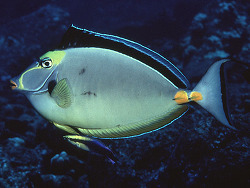 Tangs are active fish and they can be aggressive, using the spine at the base of their tail to damage competitors as previously described . 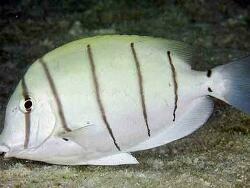 In addition, when stressed, certain members of the group are susceptible to white spot infestations. 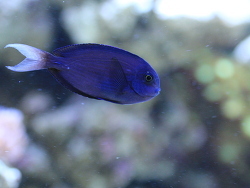 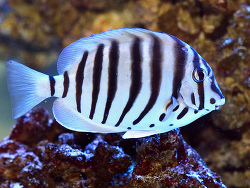 Because of the somewhat aggressive nature of these fish, most are best kept in a moderately-aggressive to aggressive fish species aquarium community. 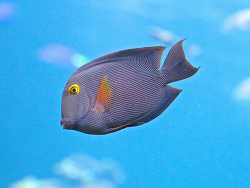 Depending on an individual fish's average size, a large enough aquarium with plenty of space to move around and lots of places to hide to keep away from other fish are best for their well being. 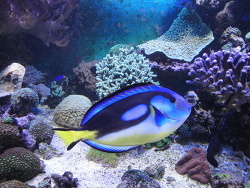 If you try to keep several of the same or multiple species together, introduce them into the aquarium all at the same time. 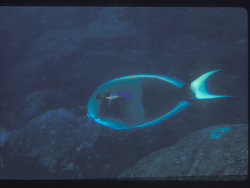 A few of theme ship so poorly they rarely recover from the rigors of capture and transport from the wild. 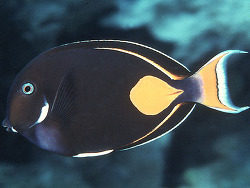 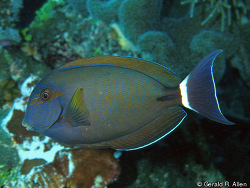 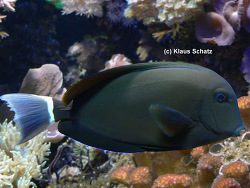 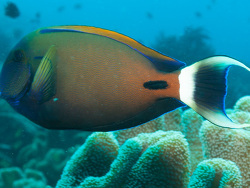 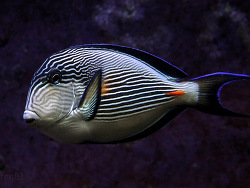 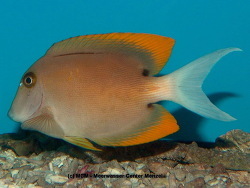 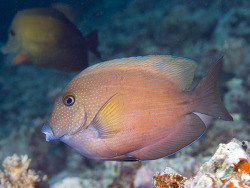 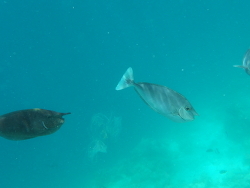 Tangs and Surgeonfishes are herbivores that in nature live upon various types of alga that thrive in the more sun lit shallower waters of the reef. 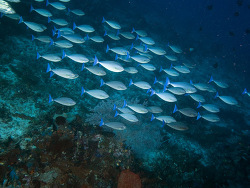 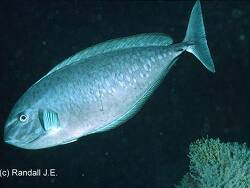 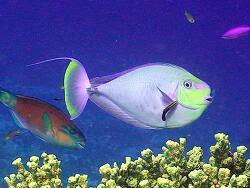 These fish can be fed a varied diet of dried and frozen herbivore foods that contain marine algae. 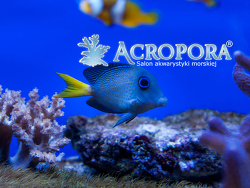 Their diet can also be supplemented with fresh vegetables such as broccoli, zucchini and leaf lettuce, dandelion as well as spinach. 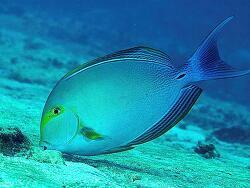 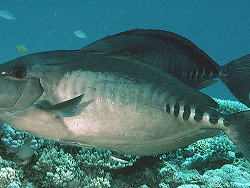 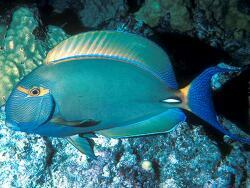 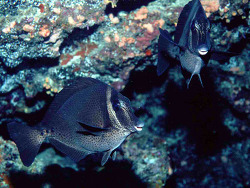 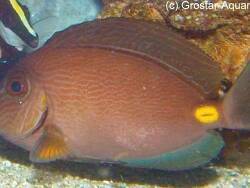 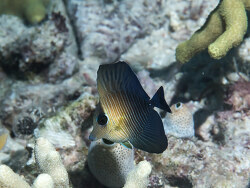 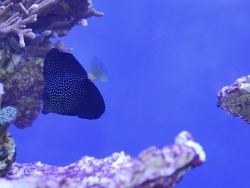 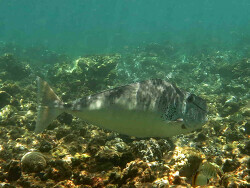 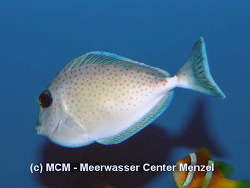 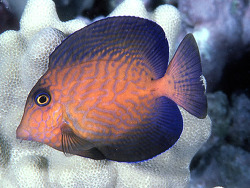 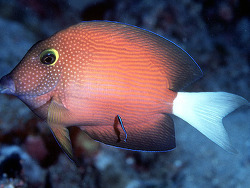 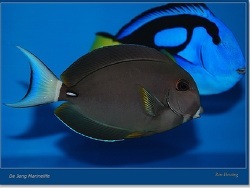 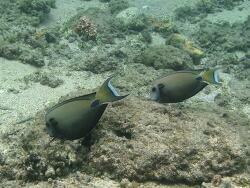 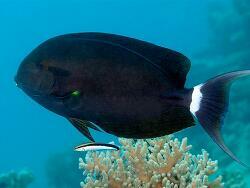 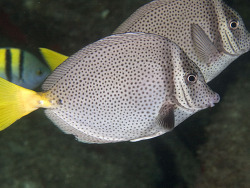 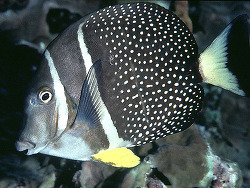 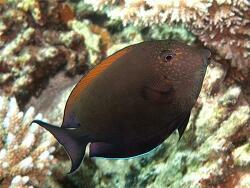 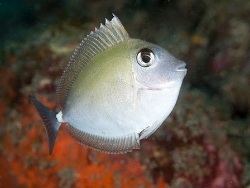 Tangs and Surgeonfishes will occasionally pick at meaty fares as well. 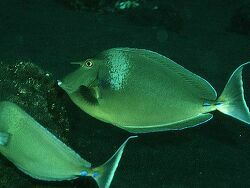 Periodically soaking foods in Lipovit, Selcon or another type of liquid vitamin helps to provide important vitamin replace that may not be completely obtained from some tank fed fares.